The GDS is a mainstay of the corporate travel industry, crucial to the day-to-day activities of travel consultants all over the globe. Still, like any industry-defining technology, the GDS faces challenges and isn’t without its limitations — we take a look at some of the most problematic. In theory, the GDSs all include powerful built-in APIs that provide everything the enterprising travel consultant needs. In reality, the complexity of using one can mean TMCs struggle to take advantage of the platform’s full potential. The technical nature of GDS interfaces means it’s often difficult for travel consultants to access the rich content they need to best inform and advise their customers. Content available on supplier websites—such as information on amenities, cabin layouts, and car hire options—isn’t always easily viewed through the GDS, effectively forcing travel consultants to go ‘off-GDS’ and check multiple sources while booking a single trip. The modern business traveller has unrestricted choice in almost every corner of their life: from the food they eat to where they choose to holiday to the device they book travel arrangements on. This coupled with a steadily growing appetite for ‘bleisure’ (the combination of a business trip and leisure activities such as sight-seeing) has seen travellers come to expect the same from their business travel provider. Travellers can point to a wealth of choice on offer for leisure travel, provided by platforms such as Expedia, Skyscanner and Kayak, but unfortunately business travel as a whole has been slower to offer the same choice. Understandably so, after all, just 5 to 10 years ago business trips were just that—staid, utilitarian affairs that didn’t venture much further than the local Hilton. The GDS providers, like the rest of the industry, have so far struggled to adapt to meet growing traveller expectations. While the GDSs can offer a pretty impressive choice in hotels, flights, and ground travel options, it’s not yet equivalent to what travellers can find themselves on the open market — increasing the risk that travellers will go ‘off policy’ to find what they want. In the same vein, the GDSs are faced with the increasingly thorny problem of sharing economy players like Airbnb. A growing cohort of younger business travellers, who’ve grown accustomed to using these services through leisure travel, are demanding the same access to sharing economy options for their business travel. While the data passed to TMCs through the GDSs is very valuable, the way it’s delivered can be difficult for travel managers to interpret. Raw data from a GDS arrives in a form that’s only a couple of bird symbols away from hieroglyphics: it’s a complex stew of numbers, words and acronyms—from which travel managers have to determine itinerary details, timetables, pricing options, seat availability, and customer history. Translating it manually is possible, but it’s also very time consuming, especially when multiplied by all of the tasks this information is needed for on an average day. Well, there’s a lot to be said to for a common-sense approach. Most of what TMCs need is already within the GDS, it just needs a couple of tweaks and add-ons to make it really purr. For instance, difficulties in translation can be mitigated by using a GDS content decoder. These tools capture information from an active window in the GDS, decode the text and deliver an easy-to-read document straight to your desktop. Likewise, some of the challenges surrounding traveller choice can be bested with additional plug-ins and integrations with third-parties. A great example of this is Expedia’s affiliate network which gives travel consultants access to a vast array of options — including Airbnb style rental properties — on top of what’s available through the GDS. All that’s needed is an integration tool to provide access. 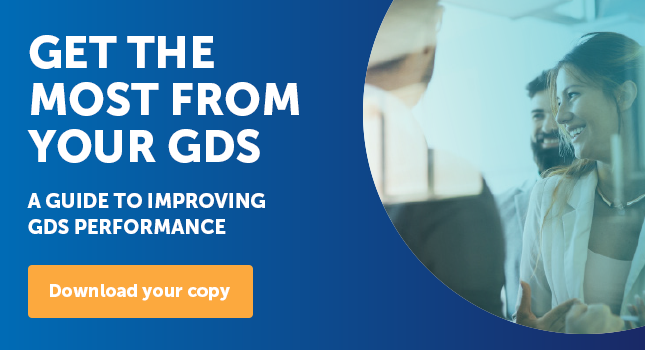 These are just a couple of suggestions for TMCs looking to harness the GDSs' full potential and we cover all the options in greater depth in our new ebook, How to Get the Most from Your GDS. We look at how everything from automated ticketing and visa checking to PNR management tools can improve the performance of your GDS and give you more satisfied travellers. 5 Tips for Streamlining Complex Business Travel Arrangements What Should You Look for in a GDS Add-on?